AV Installs Custom TV Mounting Service is suitable for all makes, models and sizes of flat screen TV's including LED, LCD, Plasma and 3D TV's. The Service comes complete with an initial telephone survey and if required a home consultation design visit. The service gives customers the opportunity to discuss with an expert engineer what their requirements are and to get some advice on what products and installation options are suitable. Once the initial stage is completed a full written quotation detailing everything discussed and the possible installation solutions open will be provided for your consideration and approval. All custom TV mounting installations come complete with our hidden cabling solution so that no interconnecting leads running from your equipment back to the TV screen are visible providing that minimalist designer appeal. Every custom installation comes complete with a full twelve month installation warranty and a customer satisfaction sign off sheet. AV Installs is a Northamptonshire Trading Standards Approved Buy With Confidence Member and only uses its own engineers which are CRB checked. 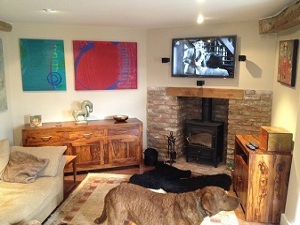 Previous requests for custom installations would include ceiling mounted TV installation, motorised Ceiling TV Lift Installations, our own TV Mirror Framing Services, TV lift furniture installation, kitchen work top and wall cupboard motorised TV installations. 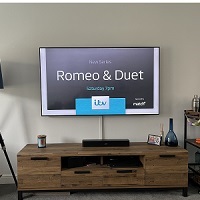 The Custom TV Wall Installation Service is a tailor made service and pricing is not fixed, Av Installs however can give an initial estimation subject to a telephone questionnaire prior to any home visit being booked. An initial deposit of £75.00 is payable to book a survey service and will be taken of the final invoice.